The SP15, notable for its lightweight design, is a member of the “Simple Precision” series. It was specifically designed to print repro proofs from metal type forms on specially formulated paper, which were then used to make photo-litho plates for offset printing. It was also used for laboratory testing of ink and paper. 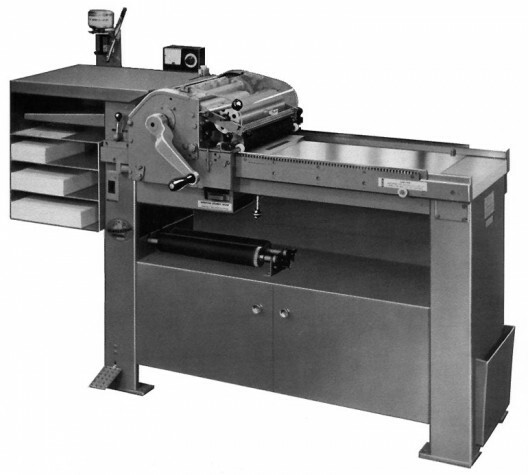 Unlike earlier Vandercook models, the impression cylinder is automatically in print mode when at the feed board, thus there is no movement of the eccentric during the forward carriage travel unless it is manually shifted into trip mode. The SP15 features the “quick change” rollers introduced with the Universal series. The gripper bar (simpler and lighter than earlier models) is the same style found on later Universals. Power ink distribution and an automatic wash up unit was standard, but a non-motorized variant, with a hand wheel mounted on the front form roller, was also available. Maximum form: 14¾ × 20″; maximum sheet: 14 × 18″. Nearly 350 SP15 presses are listed in the Vandercook census. See also SP20 and SP25.